Beyer, R. 2009. 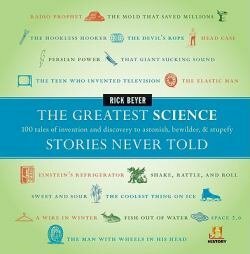 The greatest science stories never told: 100 tales of invention and discovery to astonish, bewilder, and stupefy. NY: HarperCollins. Brought to us by the network that continually surprises us with history facts comes a book that reveals many facts about science (invention, anatomy, space, electricity, etc.) that are surprising. The book is organized by year, from 265 BC to 2004, with each fact written as a small narrative illustrated by related photographs and drawings. Great jump off points for high school papers on inventors and inventions. Explain that social and cultural priorities and values are reflected in technological devices. Identify historical examples of human innovation in the areas of food production, clothing, and self-defense.